This cheesy bread and butter pudding is one of the best brunch dishes I have come across. It has to be prepared the night before, which makes for a flying start the next day. 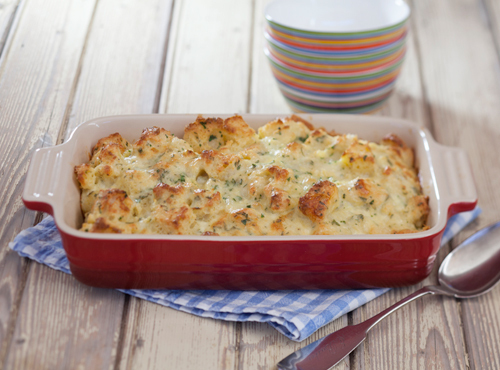 Cut bread into 2 cm cubes, then put into a large bowl and add cheese and herbs. In a separate bowl, whisk eggs and cream, then season to taste with salt and pepper. Pour egg mixture over bread and mix lightly. Leave overnight. Next day, preheat oven to 180°C and lightly grease 6 x 150 ml moulds with some of the butter. Lightly mix batter and spoon loosely into moulds to two-thirds full, ensuring there is an even mix of bread and cheese. Drizzle over remaining butter and bake until puffed and golden, about 15 minutes. Serve at once.